While I’ve been an avid collector of Kotobukiya’s Bishoujo Statue line, I’m relatively new to the world of Koto’s Fine Art Statue Series, having only previously purchased the Green and Red Fall of the Hulks Statues. Something I haven’t been terribly sold on with some of Koto’s Statues is some of their human faces, which have lacked a bit of detail for my tastes, so I’ve been more interested in their non-humanoid faced characters. 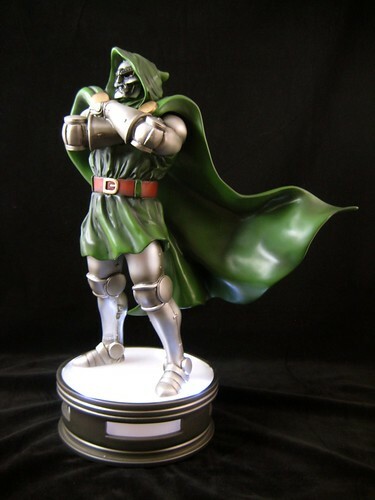 The Kotobukiya Collection Villians Series Dr Doom Fine Art Statue fits the bill! 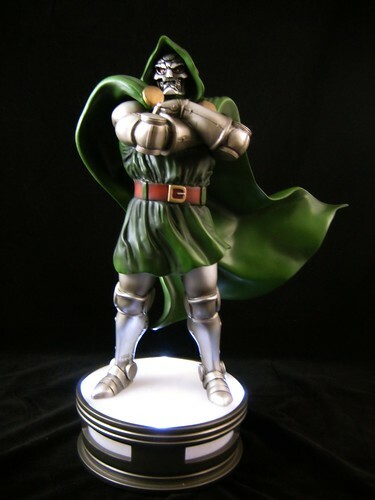 There were Dr Doom Statues coming out from Koto and Bowen at the same time, and as I hadn’t pre-ordered either, my decision on going with the Koto came down to costs on the secondary market. I’d seen the pieces from both companies in person and felt there wasn’t a great deal of aesthetic difference, so decided to give Kotobukiya another try. Overall, I’m very satisfied with the decision. At first I thought this statue was on a slightly larger scale than an average Bowen museum statue, but once I made some comparisons, it’s just an effect created by the rather large and high base and the width of the statue due to Doom’s cross-armed stance and flowing cape. It makes this a rather dominant piece, having a character like Doom as a more prominent figure in a display isn’t a bad thing in my book! This a great sculpt. It’s a powerful, imperious stance, and Doom’s armour has been beautifully captured. His tunic is very nicely sculpted and his cape is just sensational. It “flows” beautifully and is certainly the making of the piece. The paint job is generally very good – the green sections of the statue are excellent. The only detractor to the paint job is the “gold” sections on Doom’s cape, which have noticeable brush strokes. Something I quite like about Kotobukiya’s statue efforts is their willingness to try different things which can add feature that set their pieces apart. This statue has two such features: swappable face masks and a light-up base. The face masks are actually pretty hard to tell apart, but they are different, and each a comic-accurate representation of Doom’s metal kisser. One looks a little bit more crazed than the other, so I went for that one for display. Very technical reasoning, I know! The masks are really fantastic pieces, not just for the detailed rivets and great angles, but also for the scarred flesh and eyes behind the mask. The more impressive feature here is the light-up base that the statue securely sits on. This is battery powered and lit by the flick of a switch positioned at the back of the base. I had expected the whole base to light up, but it’s actually four pinpoint lights which cast a glow beneath our favourite Latverian dictator. This is a great touch. These lights are small but they are quite effective. I wouldn’t buy a piece for light-up features, but they certainly don’t do any harm! This is quite a nice piece, but there are a couple of issues – one with the statue itself and another more generic issue with Koto’s Fine Art Series. When I opened the statue, there was an brownish, oily residue running down Doom’s right leg below the knee. This came off with a bit of rubbing with a damp cloth, but it’s left a mark in that the metal areas where the goo was are now a little bit lighter than those around it. It’s not something that would be spotted by the casual observer, but it’s still a concerning fault. One thing that detracts from the Kotobukiya experience is unpacking the statue. The styrofoam packing used on the pieces is quite cheap and brittle, so it’s pretty much impossible to get your statue unpacked without spreading little white bits everywhere. This is obviously one way Koto keeps the cost of these items a bit lower than some of their competitors, but it really doesn’t scream “Fine Art” to me. At the end of the day, of course, it’s about what you see on the shelf, and with Doom casting such an impressive figure, neither of those things are going keep me from enjoying this statue, which I expect to be doing for many years to come. I’ve also made an even more recent addition to my Kotobukiya Fine Art Statue collection which I am enjoying just as much, if not more, and am looking forward to reviewing here in the weeks to come! I agree with most of your blog, except the brush strokes on the gold cape medallions. I think the brush strokes actually enhance the statue as it gives it a worn look kind of in the vein of antiquing. I have always had a bias to Bowne as that was the only thing availiable to me for some time, but Kotobukiya is putting out quality work and I do find myself looking more at their offerings. and buying lately. Oooooh! I knew there was a reason I'd stopped commenting on every post. There all so damned pretty, and all so much more than free. 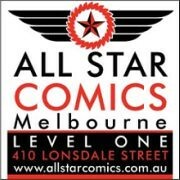 It's only a matter of time before I breakdown and buy something seen here (especially with my Nerd Cave in progress). This is quite a nice looking statue. It's something I wouldn't mind owning, though it's not anything I'm likely ever to own.